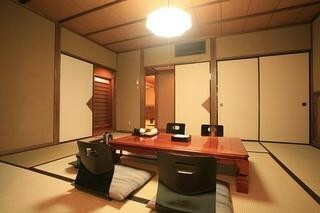 Our ryokan has a capacity of 50 people. 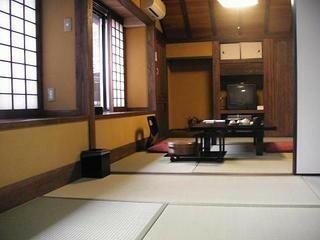 We have 15 Japanese-style guestrooms, which are clean, comfortable and peaceful. 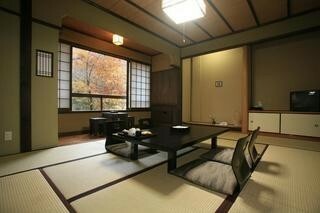 You may even be able to hear the relaxing sound of the Tanoharu River from your room. The Fuji suite has Western-style beds and a private indoor stone bath. 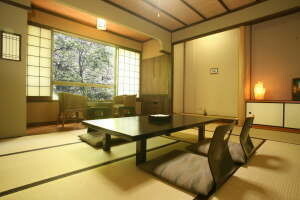 Guests staying in the Main Building may have dinner served in the comfort of their room. We invite other guests to enjoy dinner in the restaurant while seated at the “irori”, a traditional Japanese sunken hearth. Please note that dinner is at served at 6:00 pm or 6:30 pm. Don’t be late for your reservation! Breakfast is served in the Main Dining Room at 8:00 am or 8:30 am. Other facilities include a big Japanese style banquet hall for meetings or parties, a gift shop, and vending machines for drinks.